Refrigerators or fridges are one of the few appliances, apart from televisions, which have become omnipresent today. Almost in every urban household you might find a refrigerator standing in a corner of the house. It would not be an exaggeration if it is said that refrigerators have become an integral part of urban lives today. It performs a myriad of functions and contribute largely towards making our lives more comfortable. So it is needless to say that one must do a lot of research before going ahead with buying a refrigerator in order to buy a product which is best suited to one’s needs. If you are looking for the best single or double door refrigerator/fridge in India in 2019, then you have landed at the right place. In this post we will try to provide you some tips to buy a new Refrigerator. But before that, we will provide you the information that you came here to look for: The Best Refrigerator/Fridge Brands and Best Models in Refrigerators. For the Buying Guide, click: here. To read about Latest Technologies in Refrigerators in India click here. The most commonly bought size range for single door refrigerators is between 180 and 200 lts. Typical budget that people have is about Rs 20000. When we searched for a model that satisfies these two criterions, is stylish, energy efficient and feature rich, Samsung RR20M1Y2XUT/HL came up as the best model. This BEE 5 star rated model is energy efficient and has Digital Inverter Compressor. The compressor provides it good control over temperature thus helping in keeping food fresh for a longer duration. The model also has Cooling Retention technology which can keep freezer cool for 9 hours during power cuts. The shelves are made of toughened glass which make them durable. It has auto close function and built in deodorizer to keep the smell inside the fridge good. It is a stabilizer free model just like most refrigerators available in market these days. On the whole a great buy. Pros: Inverter compressor makes it energy efficient, reduces noise and also makes it compatible with Solar and power inverters in general. Cons: As it is a direct cool model, it needs manual defrosting. Cooling retention technology just works on freezer and it would have been great if this model had a cool wall for the whole fridge. Samsung’s range of models with Digital Inverter Compressor and Smart Convertible feature are quite popular these days. This BEE 4 star rated model is among some of the most energy efficient models in this size range in the market. These convertible models have a separate fan (and evaporator) for fridge and freezer, giving it a possibility to individually control the temperature of fridge and freezer separately. It also allows you to convert freezer to fridge in case you want to store more veggies. It also has a cool wall to keep the fridge cool for 12 hours during power cuts. The model also has Power Cool & Power Freeze functions for rapid cooling of fridge or freezer in case needed. The All-Round Cooling feature makes sure that every corner of the fridge is cool. This model also has a stabilizer free operation. Certainly, worth a buy if you are looking for a Medium Sized fridge for your house. Pros: Inverter compressor makes it energy efficient, reduces noise and also makes it compatible with Solar and power inverters in general. The convertible fridge feature gives more space to store veggies in case it is needed. Cons: Does not have the 5 in 1 convertible feature that bigger Samsung fridges have. So there is individual control of temperature in freezer and fridge section, but you cannot shut off one section completely when not in use. Also Samsung models have concealed condenser (no coils at the back), and to do so, they have heat coming out from the refrigerator even from the sides. So at times it feels quite hot while touching it from the side. This 495 lts Dual Fridge model from LG is a great buy if you are looking for a bigger refrigerator for your house. It is a BEE 4 star rated model with Inverter Compressor. The ice beam cooling function makes sure that all corners of the refrigerator are cool. Dual Fridge feature gives an option to convert freezer to fridge in case it is needed. This feature especially comes in handy when you have lot of veggies to store. Separate evaporator/fan for fridge and freezer also allows independent granular control over the temperature of different sections. LG additionally provides SMART diagnosis feature with which your fridge can communicate with LG customer support on its own (via your computer) and thus it helps in easy diagnosis of issues in case of failures. The SMART Connect in LG refrigerators make it very easy for them to connect to Solar or any power inverter. This fridge also has shelves made of toughened glass making them durable. It also sports a deodorizer to keep the air inside the fridge fresh. This fridge also has a stabilizer free operation. On the whole a great buy. Cons: It would have been better if this fridge also has a cool wall feature to keep the fridge cool for long hours during power cuts. Bottom Mount Freezer is a new in-thing in the refrigerator market. Having freezer at the bottom gives a lot of comfort in using a fridge as one does not have to bend down most of the time while using the refrigerator section. Haier is one brand that is aggressively bringing this feature to the customers. A premium Chinese brand, Haier has been gaining popularity in India and its products are certainly quite good and pocket friendly. If you are looking for a bottom mount freezer fridge then your choices are quite limited, but Haier HRB-3404BS-R is a great choice. This model has 360-degree air flow technology to keep every corner of the refrigerator cool. It also has a much bigger vegetable crisper to store a lot of vegetables. The 1-hour Icing Technology makes sure that you get ice as quickly as possible. It also has a cool pad to keep the fridge cool even during power cuts. Being bottom mounted, it has a big freezer and so it is good if you want more freezer space. Pros: Being bottom mount freezer it significantly reduces your need to bend to pick things. BEE 3 star rating means that the fridge is decently energy efficient. Big freezer is good for people who want to have more freezer space. Cons: Does not have inverter compressor so temperature management will not be as consistent. Also, the noise will be more than a model with inverter compressor. Key Specs: 320 lts (86 freezer and 234 fridge). 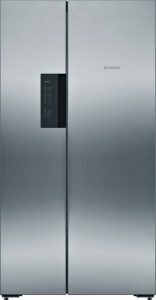 This BEE 4 star rated single door model from Samsung is a great buy if you are tight on budget but still want to buy a good fridge. It is energy efficient and comes with an inverter technology compressor. It works on home and solar inverter giving you an option to easily run it during power cuts. It also has cooling retention technology to keep the freezer cool for 9 hours during power cuts. Digital Inverter compressor provides it good control over temperature thus helping in keeping food fresh for a longer duration. The shelves are made of toughened glass which make them durable. It has auto close function and built in deodorizer to keep the smell inside the fridge good. It is a stabilizer free model just like most refrigerators available in market these days. If you are looking for a budget fridge, then this is a good buy. This BEE 4 star rated refrigerator from LG is a great value for money refrigerator as it comes with great efficiency and is not very expensive. The design does not look flashy and it also does not have a dual fridge feature. But it still has inverter technology compressor which keeps the food fresh for long. Multi Air Flow and Ice Beam Door cooling ensures that all the corners of the refrigerator are cool enough. It also has LG’s Smart Diagnosis system which communicates directly with LG’s customer service (through your computer) in case of issues. Auto Smart Connect also helps it connect with solar and power inverter in case of power failures. This slightly trimmed down (in features) version of LG Frost Free refrigerator is a great buy in case you are slightly tight on budget but still want a good double door refrigerator. Cons: It would have been better if this fridge also has a cool wall feature to keep the fridge cool for long hours during power cuts. Also, it is not a convertible model which would have been better if you wanted more fridge space. Looks wise it is very basic. If we have to think of brands that provide top notch technology, one brand immediately comes to our mind: Bosch. This German brand is known for making quite robust products and this side-by-side fridge is no different. One big concern for side-by-side refrigerators is that they do not have star ratings, but a model that has inverter technology compressor does give some assurance for energy efficiency. This model has VarioInverter compressor and is A++ rated as per European Energy Efficiency Standards. The refrigerator boasts of a large capacity to fit groceries of different sizes. The body of the refrigerator is made of fingerprint resistant stainless steel and thus looks very elegant. It has SuperFreezing technology that prevents prefrozen food from defrosting and thus frozen food is kept much better. The multi airflow system ensures that every corner of the refrigerator is cool. The nofrost system ensures that there is no collection of humidity on the food or appliances, and instead it is collected in the central evaporator. And thus, no ice is formed inside the refrigerator section. On the whole a great buy. Pros: Inverter compressor makes it energy efficient, reduces noise and also makes it compatible with Solar and power inverters in general. Superior design with fingerprint resistant stainless steel. Large capacity and advanced technology. Cons: Does not have water and ice dispenser if you are looking for one. Also does not have cooling retention during power cuts. For more suggestions, check the list below. Click here to check double door models. The basis of this ranking is the data from BEE (Bureau of Energy Efficiency). BEE data contains yearly electricity consumption of a refrigerator and this information is self reported by the manufacturers. This list does not include our perception of various brands. The list below contains only the top ten ranked refrigerators. These are the most popular brands for refrigerators / fridge in India. These brands always compete for top most energy efficient model as well. Among the Indian brands Godrej Fridge is quite popular. If you are looking for bigger sized models then Hitachi Fridge and Panasonic Fridge also have some good models. The basic function of all the refrigerators remains the same. It contains a refrigerant which absorbs the heat from the articles kept inside and transfers it to the surroundings (this is why it is advisable to keep a refrigerator at least 6 inches away from any obstruction). Direct Cool Refrigerators – Also called as Single door refrigerator, as these have only one door on them. The freezer is inside the refrigerator. One thing which is attributed to this kind of refrigerators is that they tend to form frost in the freezer in a matter of a few days on continuous use (depends on the usage). In a single door refrigerator, the refrigerant passes near the freezer first to maximise the cooling in the freezer. These refrigerators are available in the capacity only upto 300 Litres and not more than that. So if you are looking to buy a refrigerator with more capacity, single door refrigerators are not for you. Top mount refrigerator – In this, the freezer is on the top and the fridge is beneath it. It is very common in household now-a-days. It is popularly known as Double Door Refrigerator. Bottom top refrigerator – Its again a double door refrigerator in which the freezer is below the fridge. It is gaining grounds as the user does not need to bend to put or take out articles in/from the fridge. As the refrigerator is used more often than the freezer in a household, this offers a good alternative to the existing refrigerators. These refrigerators consume more energy than Top mount refrigerator. Multi-door refrigerator – There are more than two doors in a multi-door refrigerator. There are different doors/drawers to access different sections of the same refrigerator. Needless to say, its electricity consumption is higher too. Side by side refrigerator – Side by side refrigerators offer ever more space and flexibility. It usually is double door, one door provides access to the freezer and the other to the fridge. There are some models in this category that have attached water dispenser or ice dispenser wherein one can directly obtain chilled water or ice without opening the door of the refrigerator. Since they provide an altogether separate space of the size equal to the fridge itself, it is needless to say that the electricity consumption is higher, and so is the cost of buying it. The water and ice dispensers may further add to electricity consumption as it may provide some space for leakage of air inside the refrigerator. There are some models of refrigerators in which you are provided with an option to convert the freezer to the refrigerator if and when you have more requirement of storage space in the refrigerator. There is one path-breaking technology which has been doing rounds in the refrigerators lately. It concerns keeping the contents of the refrigerator cool even during a power cut. There are a few variants available in the market depending on the brand concerned. For instance, LG Durachill has a feature of ensuring the coolness of the contents of the freezer for 2 hours during power cut. Another variant, LG Power Cut Evercool is a step further. It keeps the contents of the fridge as well as the freezer cool for 7 hours during power cuts. The prices of these variants are higher than the regular ones. For all the environment-enthusiasts out there, refrigerator manufacturers now-a-days are coming with the eco-friendly variants. The only harm a refrigerator can cause to the environment is through the refrigerant. CFC is the most common refrigerant used now-a-days and it contributes to the greenhouse emission. However R-134 or R600A are viable and eco-friendly alternatives to this. A detailed description of the types of refrigerants can be found in “Comparison of various refrigerants (R-410A, R-22, R-290, R-134A) used for Air Conditioners and Refrigerators”. BEE Star Rating program explained. Please note that currently BEE star rating is available only for Single Door (Direct Cool) and Double Door (Frost Free) type of models. It is not available for multi door, side-by-side and bottom freezer models. In case you are looking for refrigerator of such type, then the best way to ensure that it is energy efficient is to look for models with inverter technology. The inverter technology, which is available in air conditioners, is also available in refrigerators. It optimises the electricity consumption of the refrigerator by regulating the power supply to the compressor. These are the most electricity-efficient models available in the market both in single door as well as double door. Your eating habits also have an impact on the decision of the right refrigerator for you and your family. Refrigerators today are available also according to the fridge to freezer ratio. (usually 70:30 or 80:20). So if you are a vegetarian, then it is advisable to go for 80:20 model as you would need more space for storing veggies. If you are a non-vegetarian 70:30 model is recommended. People have a tendency of stuffing the refrigerator disregarding the fact that this increases the electricity consumption of the refrigerator. So it is advisable to store only those articles which might perish otherwise. Avoid buying oversized refrigerators and using refrigerator as an almirah. With increasing prosperity demands of the families in India are increasing and with increasing demand, the size of refrigerators is also increasing. But increased size increases the electricity consumption of the refrigerator as well. It is observed (based on BEE data) that with every liter increase in the volume the electricity consumption of refrigerators increase by 0.5-1 units (in the same star rating band). So a 5 star 350 liters refrigerator may consume about 50-100 units per year more than a 5 star 250 liters model. Thus it is very important to pick refrigerator of right size while buying. Also refrigerators are most efficient when they are full (not over loaded). With empty refrigerators you pay more for what you use. Defrost Mode: A direct cool refrigerator that needs manual defrost consumes lesser electricity than auto defrost or frost free refrigerator. A frost-free consumes 30-50% more electricity for same volume and star rating. But a frost-free gives a lot more convenience. Ice Makers: Many new side-by-side models have ice makers that increase the electricity consumption by 10-15% as the ice dispenser creates a low insulation area, which increases electricity consumption. More features more electricity consumption: Modern day refrigerators are loaded with features like moisture control, etc. Every feature adds to the electricity consumption (unless it is a feature designed for electricity saving). So choose the features that are helpful for your daily use. Do not just buy a loaded refrigerator just for having a feel of every feature. As every feature comes for extra cost: upfront for buying and on going for use.